I have noticed such a change in my little corner of the universe and it has the potential disrupt my normal and boring domestic habits. I have to get out in front of this. I have to make certain preparations or I might find myself overwhelmed. You see my local Walmart has started carrying yarn that I actually like. It didn’t use to. In the past I could go to buy toilet paper and yogurt and such and safely cruise the tiny yarn section just for fun. I say safely because they never had anything I wanted to buy, except for a ball or two of Peaches & Creme in a nice color. For some inexplicable reason my particular Walmart has started to carry Red Heart Unforgettable. * They have it in a dozen different colorways. Now if you haven’t checked in on Red Heart is a while, they have been introducing new yarns under their “Boutique” line that are quite nice, like Unforgettable. Red Heart still has their old standbys that your granny probably buys by the armload (mine does). They still come up with new and horrible novelty yarns every year which are purposefully designed to entice buyers who then take it to their hapless knitting instructor and ask for advice on what to do with the stuff. 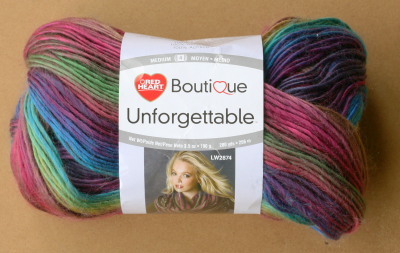 These days they also make yarn that I like, such as Unforgettable. 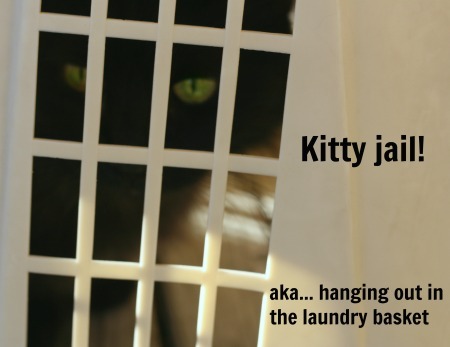 Last week I went to my closest Walmart to buy kitty litter and bagels. I was also supposed to buy a cheap desk lamp but I forgot (because I’m a terrible shopper) and didn’t remember the lamp until I has halfway home. 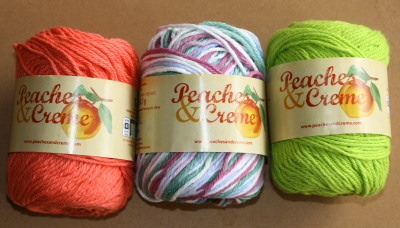 I did remember to swing by the yarn section, of course, just to see what colors they had in Peaches & Creme. Five minutes later I was standing there with one colorway of Unforgettable in my right hand and a second colorway in my left because I couldn’t figure out which I liked best. Then I realized I was in the middle of an actual yarn acquisition experience. Then I realized that I could buy one color this trip and one the next because I come to this Walmart every week. Then I realized I might be in trouble. There is only one thing for me to do. Well, maybe two things. First, I have to make room for new yarn that will be coming home with me every time I go grocery shopping. I’m thinking of getting rid of my old TV because I never use it (its not even plugged into the wall) and putting a nice yarn-storing basket there. Second, is to hope that this is a seasonal thing and that Walmart will quit carrying decent yarn in the spring. Maybe I’ll write Walmart a letter asking them to cease and desist. * Walmart is selling Unforgettable for less than the price listed on that Red Heart site I linked. I only paid $4.98 for mine. 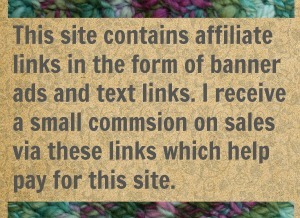 Which is just one more reason I’ll be buying yarn when I should be grocery shopping! Stupid Walmart. 27 Comments on "I Need To Make Room For New Yarn"
The Walmart near me has RH with Love, but the weight is less than the craft store oro online shopping…and priced accordingly??? i don’t know and I’ll leaves the pricing wars to the ones who make money off them! 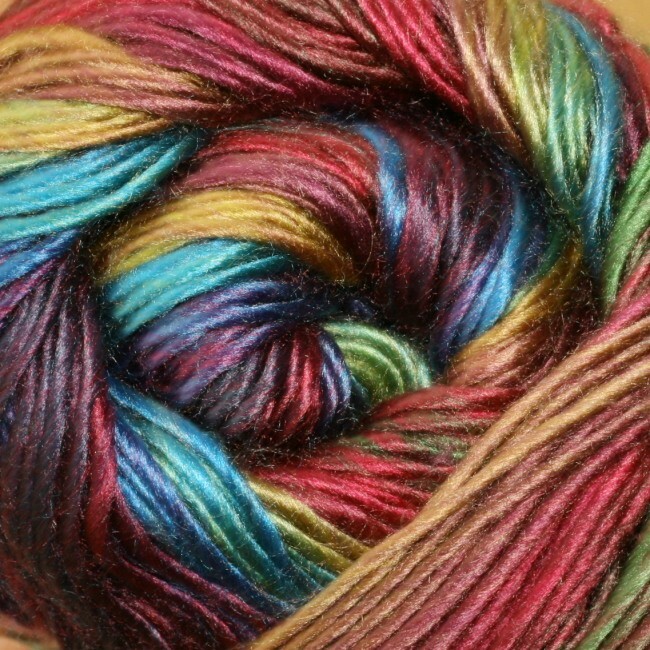 But what I purchased from my local Walmart is in fact a 100g skein. Sadly, I just really dislike Red Heart so this would not effect my shopping experience. However, I LOVE Lily’s Peaches and Cream! THIS! I’m afraid to go to my Wal-Mart now. Thanks. Any time. I’m here to enable bad yarn buying and casting on habits. I also just happened by the yarn aisle in Walmart last week and noticed they were also carrying this yarn. I had been considering a sweater pattern that had been made up in the Unforgettable. Really looked nice. The color ways are gorgeous and it is really soft. Some acrylics are itchy on me. Have you worked with? I was afraid it might split easily and I hate that, but I am going to buy some for that sweater. Thanks. I can be forgiving. I do see a trip to Walmart real soon and a sweater added to my WIP que. I should be getting a Walmart commission or something.